1 Caption: Church bells ring / like an omen. / The ocean sings; / the sea is foamin'. / You will have no shame / if Marsh is your name / breeding for an underwater lair. 2 Caption: Every year / is a leap one. / Staying here / are the Deep Ones. / They bargained our women; / now our kids are swimmin', / heading for an underwater lair. 3 Caption: Innsmouth is the place to be a mother. / Every home and building has a pool. / Everyone looks out for one another / And all the kiddies always stay in school. 4 Caption: Later on, / we'll conspire / acting out / dark desires. / With a pick-up line: / "your inlet or mine?" / Breeding for an underwater lair. 5 Caption: A loathsome and ichthyoid Christmas to you all! Yes folks, it's that time of year again! This is the Eighth Annual Christmas Eve Cthulhu Mythos Irregular Webcomic! This one is to the tune of Winter Wonderland. Which is still popular as a Christmas song here in Australia, despite the fact that (a) the song doesn't mention Christmas at all, (b) it doesn't snow in most of the populated places in Australia, and (c) Christmas is in the middle of summer anyway. Yep, you never hear that song in winter here, but it's all over the place in summer. Clearly something abominable and non-Euclidean is going on. Lyrics by Steven Marsh (direct descendent of Obed Marsh). 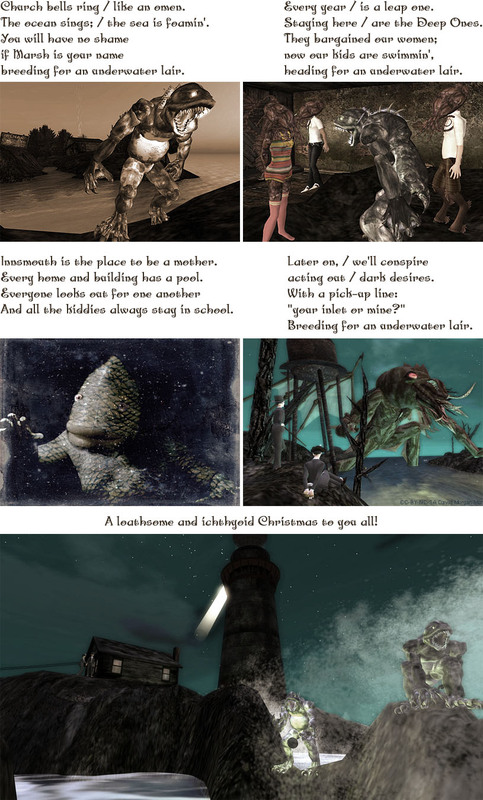 All except Catgunner's are capped from the Innsmouth location in Second Life, which you can explore here. If you dare. Last Modified: Friday, 24 December 2010; 02:11:01 PST.